William Morrow Paperbacks, 9780062486448, 288pp. - Desk-bound? You can do chair yoga! - Have limited range of motion? You can do chair yoga! - Never done yoga before? You can do chair yoga! - Don’t own a pair of stretchy pants? You can do chair yoga! - Own plenty of athleisure or loungewear, but haven’t moved much in weeks/months/years? You can do chair yoga! Chair yoga is exactly what it sounds like: exercises you can do sitting down. 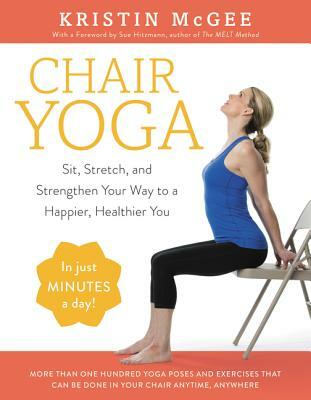 In Chair Yoga, celebrity yoga instructor Kristin McGee takes you through 100 yoga poses and exercises that are easy enough for all levels and will help readers stay active, alert, and healthy. Divided into chapters organized by body part (say goodbye to back pain and hello to better posture), each exercise includes step-by-step instructions and easy-to-follow photos. Plus, bonus chapters on 5-, 10-, and 15-minute routines help readers put it all together and find the time to perform these exercises. Now with Chair Yoga, anyone can benefit from just a few moves a day—and garner the remarkable physical and mental health rewards. Kristin McGee is a nationally recognized yoga and Pilates teacher, celebrity trainer, and the host and star of more than a hundred fitness DVDs. Kristin has appeared on Good Morning America, Good Day New York, The Tyra Banks Show, Today, and the Home Shopping Network as a fitness consultant. She is also a contributing editor for Health magazine. Her clients have included celebrities such as Steve Martin, Tina Fey, LeAnn Rimes, Ben and Christine Stiller, Bethenny Frankel, and Savannah Guthrie. She lives in New York.